7:32 PM Another large earthquake shakes Philippines a day after deadly tremor on Easter Monday. 6:59 PM Police says YNW Melly staged crime scene of double murder to look like drive-by shooting. Footage shows a building in Manila swaying and emptying its rooftop swimming pool during an aftershock of the 6.1 magnitude quake. Alleged van driver who drove bombers arrested as Sri Lanka has day of mourning for 310 killed in Easter attack. Homeless while at school, Josh Jacobs looks set to have a high profile career in American football. Political rivalries in Sri Lanka meant Prime Minister couldn't attend Security Council meetings since October. Some countries are warning travellers to reconsider travel, so what’s the official advice for New Zealanders? Three children of Danish billionaire behind fashion retailer ASOS among the 39 foreigners killed in bomb attacks. 22 year old Dale W. Ross was last seen in an area that saw heavy fighting around a Japanese-held hilltop in the Solomon Islands in 1943. On TV, Volodymyr Zelensky's character is too soft and kind - many fear politicians may exploit that perception. The lawsuit seeks to prevent accounting firm from handing over US president's financial records. Disney's CEO made 1424 times as much as his employees. An heir to the Disney fortune says that's "insane". 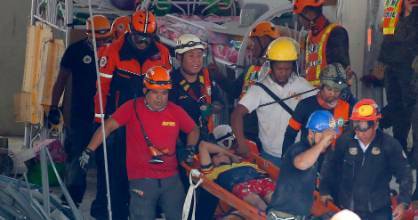 At least three confirmed dead, others trapped in debris as rescuers struggle to save them. Using Russian political dirt on Hillary Clinton during 2016 campaign was not illegal, says US president's lawyer. ​Washington state will be the first in the US to allow humans to be turned into compost. Most unusual thing NSA Deputy had experienced in 40 years of public service. Cypriot authorities suspect "unprecedented" serial killings after two women found dead in abandoned shaft. ANALYSIS: With a near-endless list of fires at Europe's historical sites, why don't officials act before it's too late? Gold wreaths, rings and statues among priceless artefacts uncovered by Greek transport project. Here is what we know so far about the bomb attacks which have killed at least 290 people in Sri Lanka. British national who "travelled to places other feared" killed after kidnappers stormed a holiday resort. Red Cross contradicts the PM's statements around the decision to name a Kiwi nurse being held by Isis. Nicolas Hénin was held next door to Kiwi Louisa Akavi. But he was released after a ransom was reportedly paid.